Growing up as a kid, my busy parents often fed my sister and I TV dinners…Swanson TV dinners to be exact. I remember them like it was yesterday. 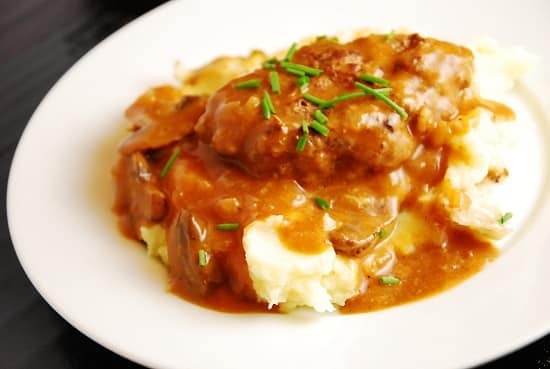 Salisbury Steak was often the main entree, and even though I now know better about eating healthy, all I knew back then was that those Salisbury steaks tasted pretty darn good. So, I decided to play around in the kitchen and see if I could make a healthier version that would be tasty enough to bring back my childhood memories of TV dinners, while still keeping the Weight Watchers Points low. I used a few traditional Salisbury steak recipes as my guideline, and then made a lot of healthier changes. I was thrilled with how delicious these turned out! I served them over some good ol’ mashed potatoes and they were a hit. I served them over mashed potatoes, but if you want to keep this really light, try them over my Cauliflower Mashed Potatoes to keep the meal Points even lower. If you were once (or still are!) a fan of Salisbury steaks, this Salisbury Steaks recipe is a must make. Enjoy! A throwback to the TV dinner days, these lightened up and much healthier Salisbury steak is a delicious way to reminisce. Flavorful, yet light, this dish makes a wonderful family dinner recipe that won’t break your Weight Watchers bank. In a medium sized bowl, combine ground beef, ½ of the onions, breadcrumbs, egg, 1 tbsp Worcestershire sauce, onion soup mix and pepper. Shape into 6 oval patties. Spray a large nonstick skillet with an olive oil mister or non-fat cooking spray and set over medium high heat. Brown both sides of patties, about 3-4 minutes each side. Remove patties from pan, and then return pan to heat. Add in remaining onions and mushrooms, and 1 tbsp of the beef broth, and cook for about 2-3 minutes. Return the Salisbury steak patties to the pan. In a small bowl, whisk together remaining beef broth, remaining Worcestershire sauce, ketchup, flour, and mustard powder. Pour into skillet over the meat, turn heat down to medium-low, cover and cook for about 20 minutes. I want to make this as a freeze ahead meal to bring to a friend.. can i prepare through step 4 and then freeze and bake to finish when ready to eat? any tips? I’m having trouble seeing how this is only 3+ Points when the meat alone is over 3 points. Then you have wheat flour bad whole wheat bread crumbs… both having at least 2-3 points depending on quantity. I’ve taken them to the smallest amount possible on my Weight Watchers foods point chart and it’s not adding up… Actually, it’s adding up to about 9-10 points for one serving of this dish. Hi, making 8 servings out of only one pound of beef seems like this recipe is more like large meatballs than Salsbury Steaks. Is the serving size correct? THANK YOU! This is parked in my recipe box ~ family hit. I changed a bit and made it crock pot. I browned the patties 3 mins both sides. Placed in crockpot. Followed the rest of the instructions and threw that in the CP. Cooked low for approx 2 hours and them set to low until we were ready to eat! Made this the other night with grass fed beef and it was delicious! The sauce is so flavorful! When do you add the 2T of whole wheat flour? Hi. I am unable to print the Salisbury Steak recipe. It looks wonderful, but the print button won’t work. Where can I go to calculate the points for the new points system?